Today I’m going to talk about something that stirs up a lot of feelings in a lot of people all over the net: pricing models. Free to Play is just what it says: Free. To. Play. Seriously, you download the game, you install it, you set up an account, and bam, you’re ready to go. It’s that simple. Examples of these games are Champions Online, D&D Online, Lord of the Rings Online, and several of the games I’ve previously mentioned like 9Dragons and ACE Online. For future reference, I’m abbreviating this as F2P. Microtransactions (I may have explained this in the past, but humor me) are where you throw a few dollars at the game here and there. Typically this goes hand in hand with a F2P model. The point is to purchase in a cash shop of sorts a few extraneous objects or such that you don’t normally get with your usual account. An example of the things that are usually available in such a shop are extra character slots on the server, additional character classes or capabilities, costume items that have no effect outside of changing your appearance, experience bonus items, and so forth. Frequently the company running the game invents some sort of point system that goes with the shop. 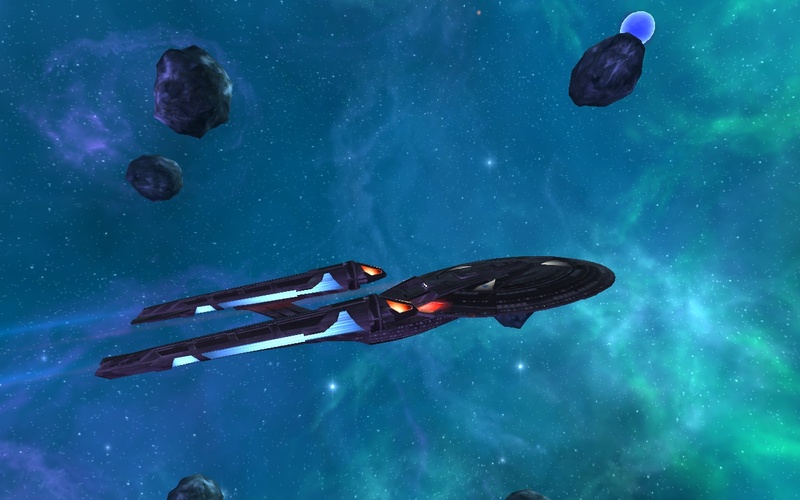 Champions Online and Star Trek Online both have their C-Store (Cryptic Store) and they take advantage of Atari Tokens. D&D Online and Lord of the Rings Online are both run by Turbine and they each have very similar shops with points named differently (DDO Points and Turbine Points, respectively). Sometimes the company running the game doesn’t even bother to do point transactions. In the case of games like Star Wars Galaxies where there’s a separate card game built into the game, you just buy booster packs and such using your credit card or whatever. Sometimes these points are easy to get (in LOTRO, you can gain Turbine Points by accomplishing deeds that award 5, 10, or 15 points and you can save them up), other times you can only get them by buying them (Star Trek Online), and still other times you can get a stipend of points per month for subscribing (D&D Online and Champions Online each offer 500 and 400 of their points per month, respectively). All in all, you’re typically not spending a lot of money at once (if at all), hence the term “microtransactions”. Me, if I like a game well enough, I’m cool with throwing twenty bucks at it (like LOTRO). Subscriptions for MMOs have always been a touchy subject but most frequently they’re priced around fifteen dollars a month. Some games (once again, LOTRO) offer the occasional discount to ten bucks a month and a few games out there are five a month (I believe Dungeon Runners used to do this). Sometimes if you buy a bunch of months in a row (like 6 or 12) you can get a discount. $120 bucks a year changes your subscription to ten bucks a month instead of fifteen… which isn’t bad if you intend to play the game for the whole year. Like I’ve implied, subscriptions can run monthly, annually, bi-annually, or whatever. Also, some few games offer lifetime subscriptions where you pay one large lump sum (often enough to buy an XBox 360 or a PS3) for permanent subscription services for as long as the game is up. I recently acquired a lifetime subscription to Star Trek Online for the paltry sum of $300 (hah, paltry) and there’s really no difference between a normal subscription and the lifetime (except for a few nifty concessions). Once upon a time, I said (upon discovering Everquest was fifteen bucks a month) that I would only truly pay to play a Star Wars game. Well, I’ve been proven wrong (DDO, LOTRO, STO and now another SW game is coming out soon). D&D Online offers a free to play model. There is a cash store where you can buy points and spend said points on objects you want. There’s also a variety of subscription options (monthly, 3 months, 6 months I believe) available for those who want free access to all the restricted content that’s available for purchase in the store (more or less). Further, for those who subscribe, you gain 500 DDO points per month of your active subscription. If you allow your subscription to lapse, you downgrade to a “Premium” account which has more benefits than a regular Free account, but considerably less than a subscription. In this case, if you’re playing a class (like the Monk or Favored Soul) that is specifically given to you because of your subscription, you lose access to that character until you purchase the class in another way (via favor or money). Champions Online has recently gone free to play. There’s a cash store where you can buy points and spend them on objects you want. They also have subscription options, but they also offer a lifetime subscription with additional benefits on top of the standard subscription. The entire game is available to play, but certain quest trees are unavailable except to those who subscribe or purchase said quest packs. For subscribers (lifetime and otherwise) you gain 400 Atari Tokens a month. If you are no longer a subscriber you revert to a “Silver Player” (as opposed to Gold) and lose access to all the things that Gold Players get specifically (you lose access to your Freeform characters and quest packs) until you subscribe again. Personally, I’m a fan of these combination models. I feel that they appeal to wider audiences and in many cases allow people to try the games until they feel like they want to spend money on it to get the extra stuff (like me with D&D Online, Lord of the Rings Online). Champions Online is now a current favorite for me and I’m highly tempted to get a lifetime account with them. Don’t worry, I make myself come up with three good reasons before I splurge on something so expensive. When looking to invest in a game, it’s encouraging that so many are going free to play with subscription options. I’m certainly a fan of being able to try stuff out before buying (like test driving a car). I have a hunch that subscription-only games are going to be phased out in the future and “choose your own pricing model” games will become the business standard. Regarding the lifetime subscriptions: personally I like to buy and not worry about things any more, hence why I’m a fan of these. 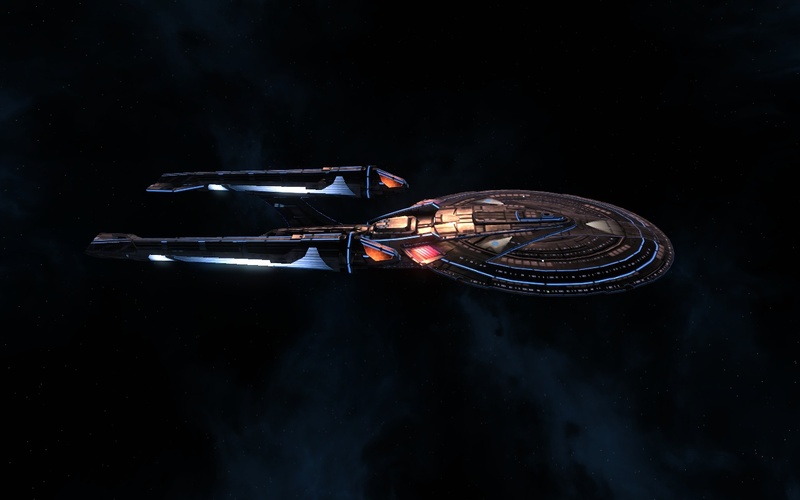 Further, Star Trek Online has held a lasting appeal for me in the last six months and I felt it was a worthwhile investment. 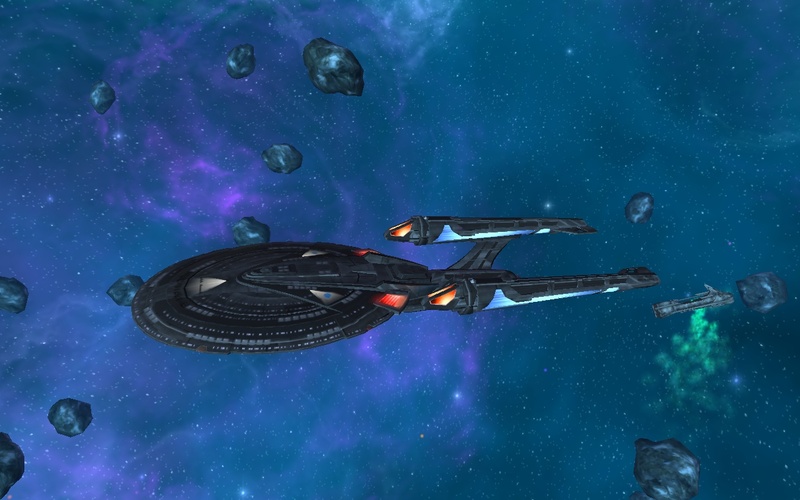 Also, STO is still a growing game. It’s been around one year (celebrated its one year anniversary the first week of February). If Galaxies had a lifetime subscription option, I’d buy it in a heartbeat. Until next time, choose wisely so that you can have a great time! P.S. In hunting down links to put up above, I found something particularly awesome that some friends may or may not appreciate. Neverwinter. P.P.S. I was right about the Dungeon Runners subscription. Booyah. I’d like to share something that’s been bothering me lately: my drive to play Star Wars Galaxies is pretty much gone. I’m still paying to play it, but I just would rather play other things (new or old). I’m going to try to explain this as best as I can, so bear with me. Let’s get something straight first: I WANT to play Star Wars Galaxies. The issue I’m having is that, well, I’ve already done everything I wanted to do in the game. I want to do more than there is. 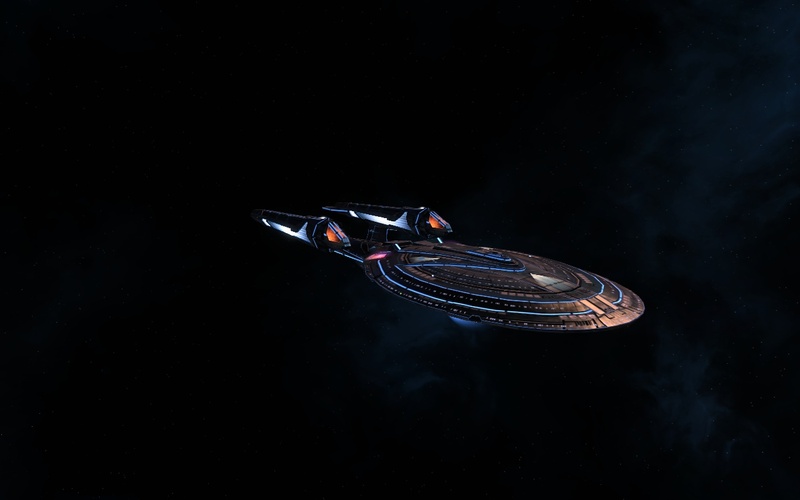 Star Trek Online is fascinating to me because they’re constantly releasing new content. Galaxies kind of stopped doing that. If you will, they decided to focus more on the in-game card game than the game itself. They haven’t developed a new planet since Trials of Obi-Wan, they haven’t released genuinely new content since Halloween of 2008 (I think) with the release of Death Troopers and the zombie problems on Dathomir. I’m frustrated because I want to play. I’m sad because there’s nothing left for me to do aside from these extremely difficult to solo (or even handle with group) quests. I’m genuinely disappointed and I wish I wasn’t. It’s almost like there’s this approach to games from the stone age still out there… that developers want a “fire-and-forget” game that they can release onto the market and not have to bother patching or releasing updates in the age of high speed internet and discerning consumers. I suppose they ask “why keep investing in one project when we can make so many more that can get us more money?” I thought the point of an MMO was to keep investing to develop a loyal player base that continues to purchase all the expansions and add-ons that you create? There hasn’t been a TRUE expansion to Galaxies SINCE late 2005 and that was the New Game Enhancement and the Trials of Obi-wan release. 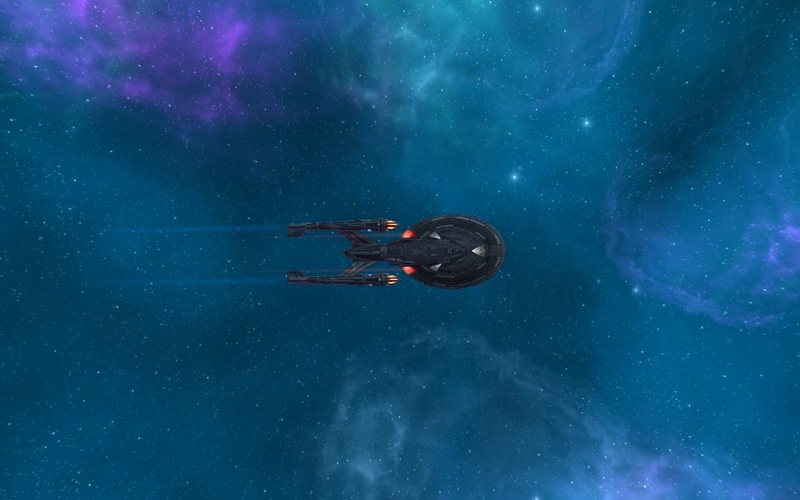 Star Trek Online’s developers at Cryptic get it. Every once in a while they release a weekly series of episodes that are fresh, new, and fun. This keeps me coming back, wanting to be prepared for the next series of episodes. I’m looking forward to the eventual release of the Romulans as a playable faction (fingers crossed!) and the ability to eventually craft my own Delta Flyer. I can’t wait to go toe-to-toe with whatever menace is lurking over the horizon, my friends and their ships ready to go. Galaxies has lost the spark it once had and I think an overhaul of approach is needed. I will admit that if they ever offer a veteran reward or an option to purchase a lifetime account, I’ll be the first to jump on it. Seriously though, I’ve been paying to play Galaxies for so long that I think I’ve EARNED a lifetime subscription. I can only hope that good things happen for Galaxies and I hope I’ll still be there to see them. In the mean time, I’ll be playing Champions Online, Lord of the Rings Online, Dungeons & Dragons Online, and Star Trek Online while I occasionally glance at the icon for Galaxies and feel that pang of sadness. Until next time, here’s hoping everything gets better and better! I’ve been away for a bit – Let’s Play Catch Up! Hey folks, I know I haven’t written anything of late here, but I have good reasons! Let me just say that Assassin’s Creed II (I played it via Steam) is hands down an improvement over the first installment in the series. That said, Brotherhood plays even better (can’t wait for the PC version to come out… I prefer the controls on the computer!). In the spirit of beating games, I dug out my copy of Mr. Robot and whipped that in a couple of days. I also picked up Recettear on Steam and beat that in a couple of days (much fun!). 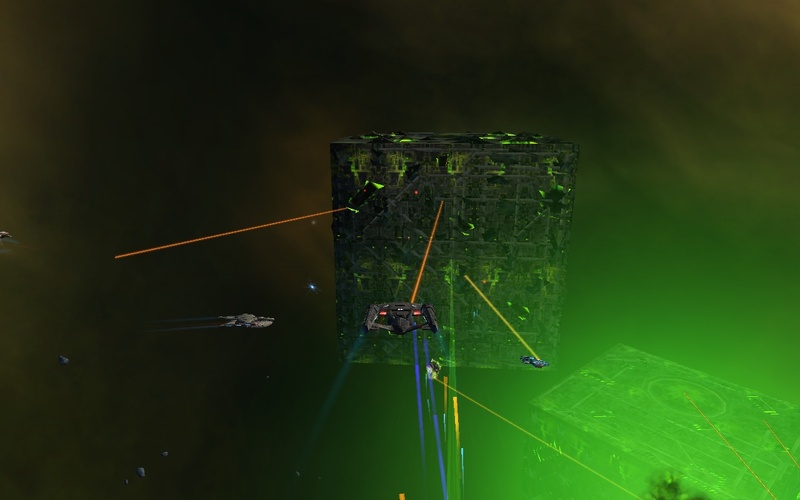 Star Trek Online did a big environmental update that changed the Sector Space portion of the game into a more graphically pleasing and “natural” environment. Further, they upgraded their crafting system so that the players can build another 400 or so items. End result? 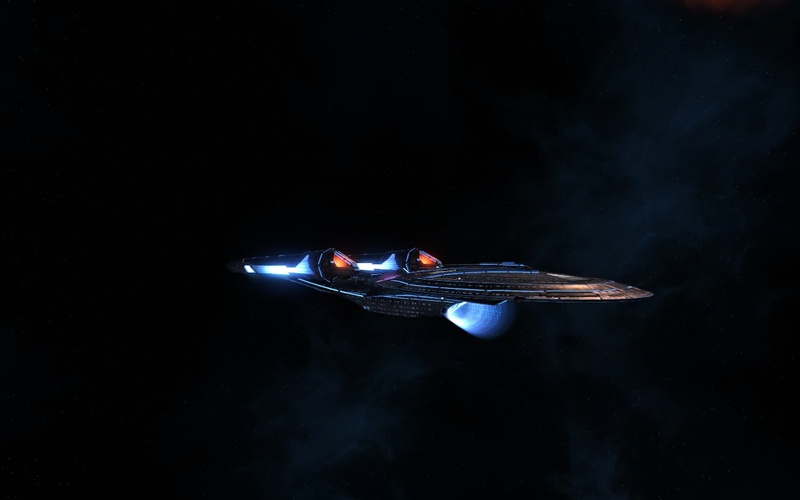 My ship, the U.S.S. Iowa-B now has souped up weapons! I spent a lot of time crafting those Phasers and Photon Torpedo Launchers, and they were SO worth it! Hey, it keeps me busy! Until next time! Keep on playing! P.S. 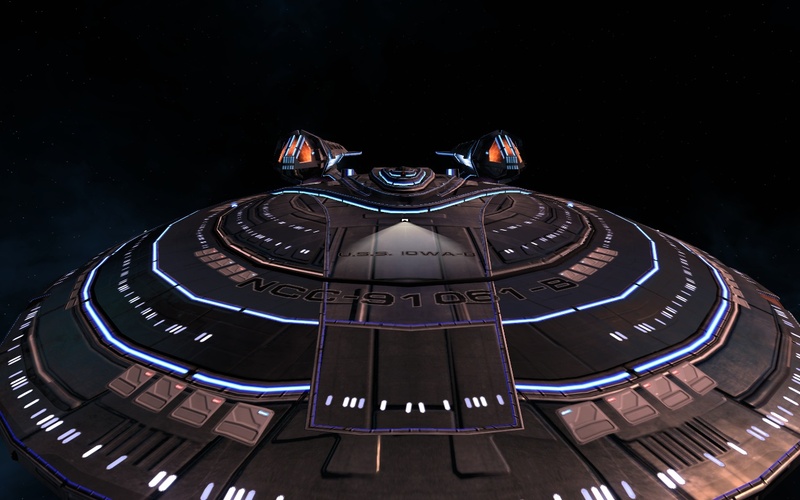 My ship that you see above is named for the U.S.S. Iowa BB-61, the last lead ship of any class of United States battleships. My grandfather commissioned her in 1943 and served on her during World War II. “The Big Stick” is a source of pride in my family and my grandfather was quite tickled that I named my ship for the Iowa. If you look above, I even got the BB-61 on her somewhere. P.P.P.S. I’m using Wikipedia links for my references because in the linked articles, there are links to other relevant sources for whatever I’m referencing. This makes things way easier on me and on you, the reader. Enjoy! 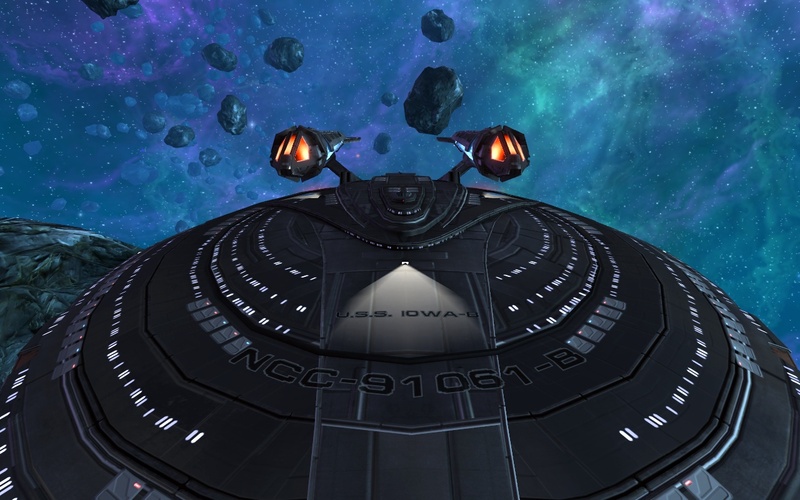 EDIT: December 24th, 1:45 AM – I just got off playing some Star Trek Online and the U.S.S. Iowa-B is looking spiffy with the addition of some cool new equipment. My friend and I refer to it as “Tronning out”. Enjoy! She looks so awesome! Until next time! My apologies for not writing anything recently. I’ve been wrapped up in games and this kind of took a back seat. I wish I could talk about what I’ve been playing a lot this past week or two, but I signed a Non-Disclosure Agreement, so I can’t give my impressions until later. In the meantime, I’ve been playing D&D Online and I’ve got a game of Civilization IV going with a friend of mine. I’ve got an article idea bouncing around in my head regarding the player and their familiarity and sense of belonging in the game world. This is something very relevant today, especially in light of the vast numbers of multiplayer online games and the persistent worlds that many of them have. I find myself fascinated by games that have to do with existing mythologies or well developed environments. Examples of these are the Star Wars universe, Tolkien’s Middle Earth, the Forgotten Realms, and Greek Mythology/Homerian Epics. Like I said, it’s an idea, and I hope I can figure out how best to explain it soon. In the meantime, I’ve managed to secure a ticket to the Distant Worlds Final Fantasy concert. If you’ve read my article about music in games and my article about immersion and the part where I discuss the role music plays, then you’d understand that I’m a huge fan of game music. I especially like it when it’s performed in concert halls and the like. I guess it’s a way of realizing that the music that I grew up with is now recognized as important. Can’t help but feel a bit proud that I got in on the ground floor. P.S. George Washington fought dragons. Spread it around!